The App is the mobile companion to InventoryBase which will allow you to produce reports in the field without a need for an Internet connection. 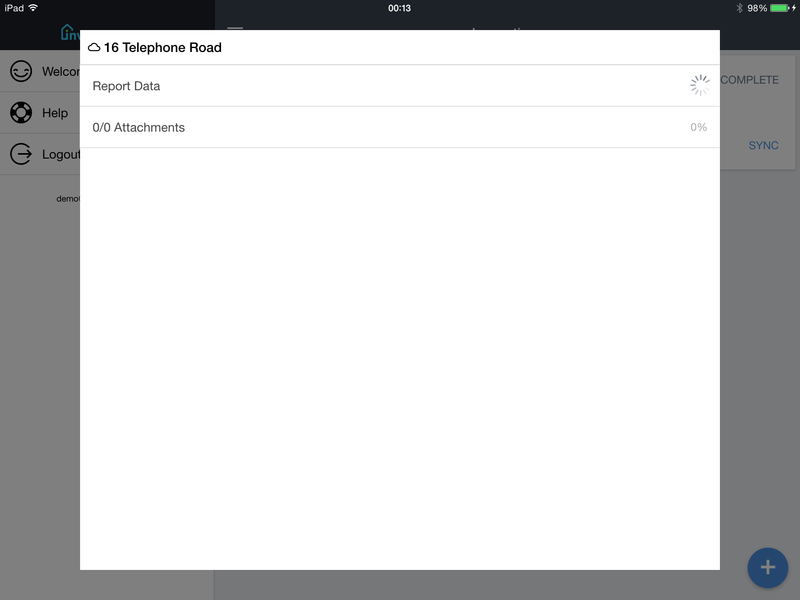 Once reports have been written, voice notes recorded and photos captured, you can restore Internet connection and Sync (upload) your report up to InventoryBase, either completing the report with signatures on the device, or uploading it to make any final amendments online before submitting to recipients. Login to the App with the same email address and password you use to login online. 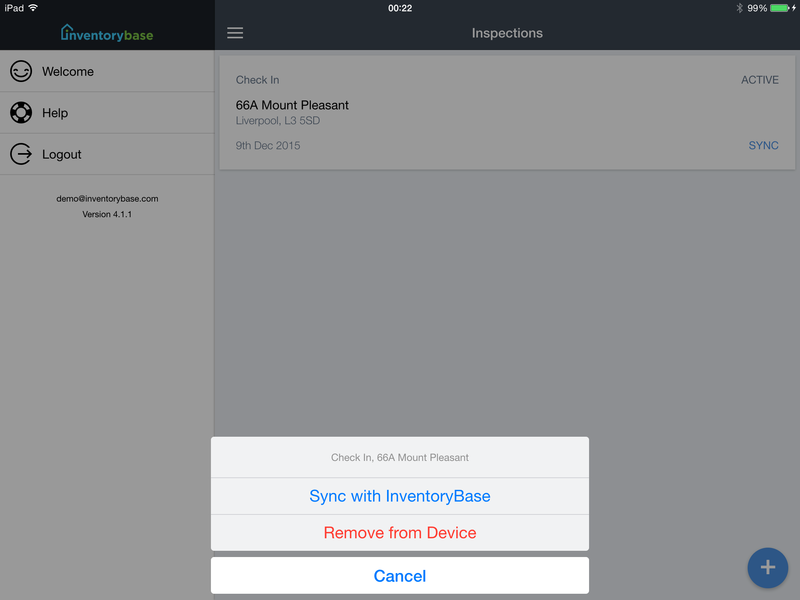 When you login, InventoryBase will download all your assigned inspections both pending and active. Note: At this point, you no longer need an Internet connection to be able to produce a report. Once logged into the App, click on an inspection for the property address you've arrived at to begin. Click on the Property you are producing the report for. You will be presented with the Inspection information screen. 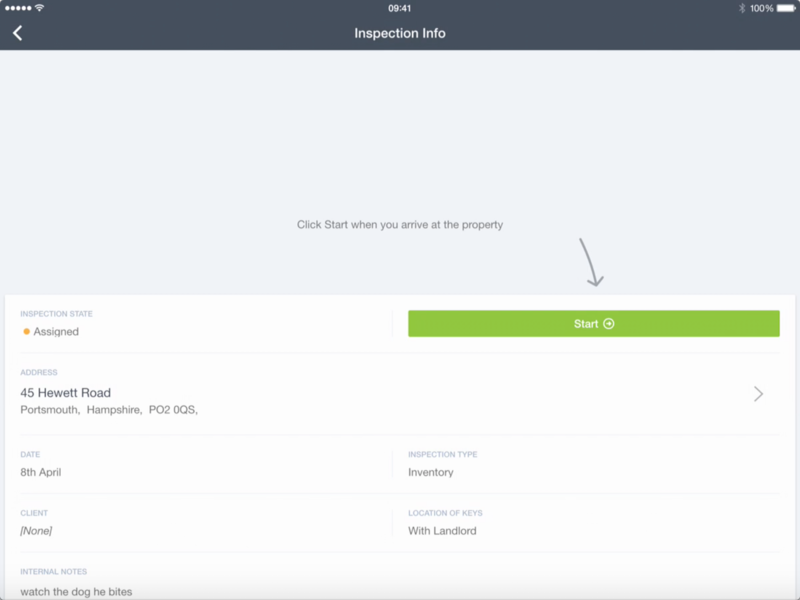 From this screen you can see the Inspection type, eg Inventory, Check in or Check Out, the full address and date to conduct the report. You'll also see the location of keys and internal notes, and be able to get directions by clicking on the property address, which will launch the Map client to find the property. As soon as you’re ready to begin the report, click Start. You won't be able to access the report until you do. From outside the property, you can take an external photo of the front exterior or entrance by clicking on the Camera icon within the Cover Image placeholder. Click on the Report button on the top right of the screen to start adding report data. The first screen you'll be presented with is the Rooms list. This will either be blank, or a pre-loaded template of rooms and items you can remove or add to. Add a new room by clicking the blue (+) button on the bottom right of the screen, add new items by clicking on rooms and clicking the blue (+) button on the items page. If you want to DELETE a room from this list, swipe the room from right to left. If you want to COPY a room to another room, click Copy from the same swipe menu. Click on a room to start adding conditions for items. 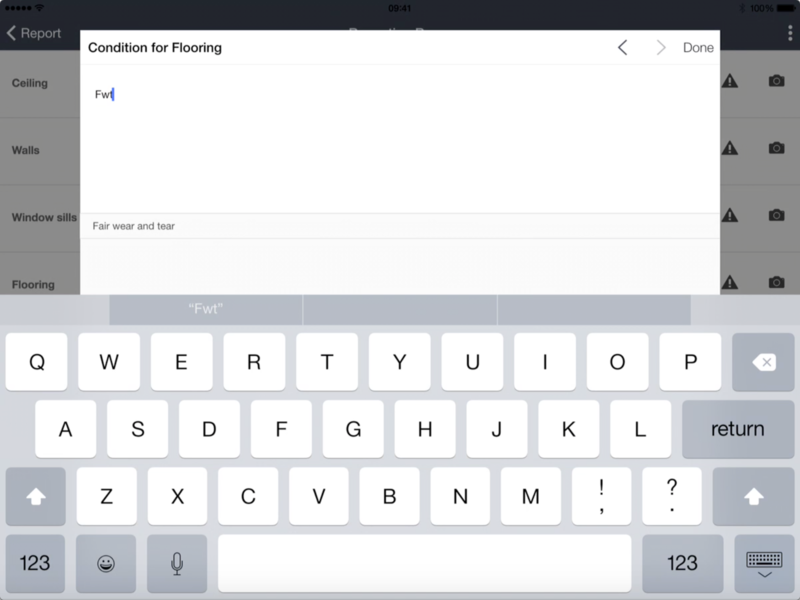 When you are entering Descriptions and Conditions, your pre-filled customisable Dictionary will suggest words and sentences as you type. Type shortcuts that consist of the first letters of words in a sentence to access long sentences faster, i.e. 'FWT' for 'Fair wear and tear'. To edit item names, just click on the item name in the list. 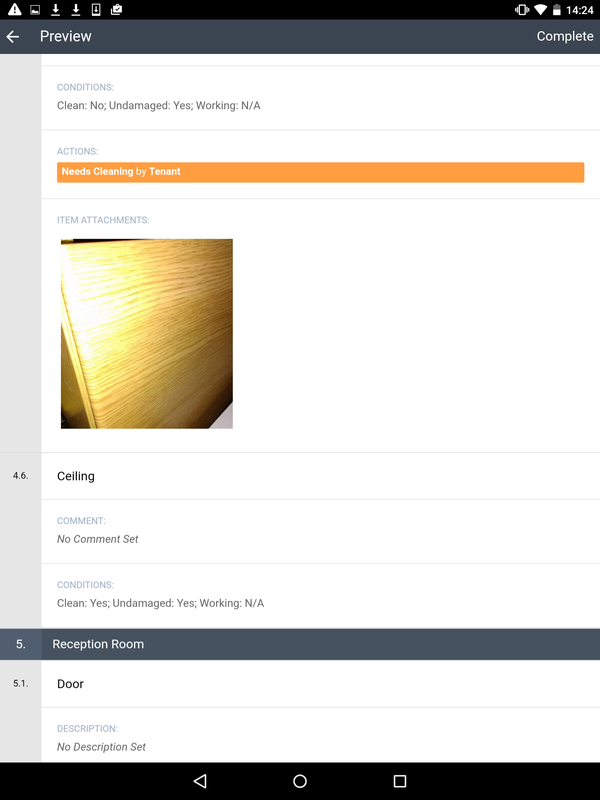 Note: Room and Item names can only be edited on the first report per property, or on standalone inspections. Photos can be taken on rooms or for items individually. Just click the Camera icon on the item you're taking it for, or scroll to the bottom buttons to take them at the Room level. Photos will appear on the report with their reference number relating to the room number or a particular item number within that room. You can also flag a follow-up Action for this item within the report by clicking on the Triangle/Exclamation icon, such as any cleaning or repairs required that either the tenant or landlord may be liable for. 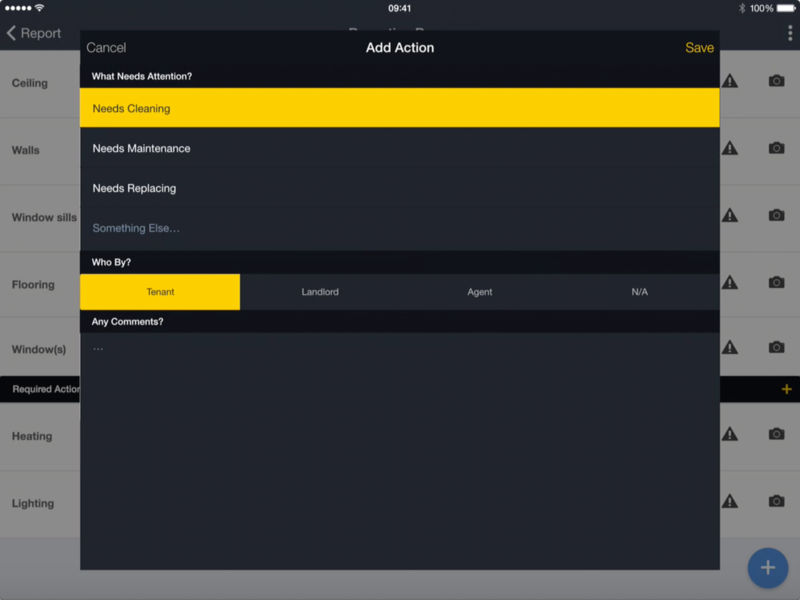 InventoryBase will create an additional Actions-only report for all follow up actions created within this report. 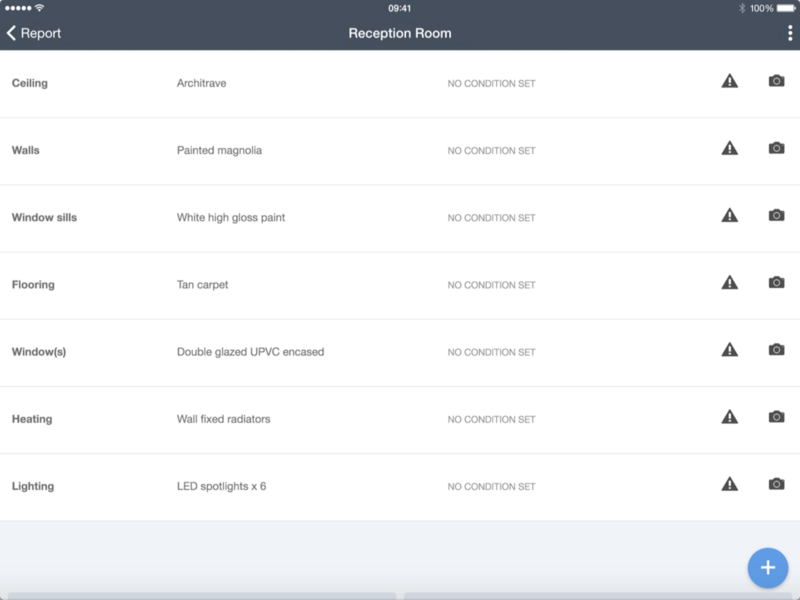 The Room menu (3 dots on the top right of the items page) contains options to rename the room and access the Audio Dictation Recorder. 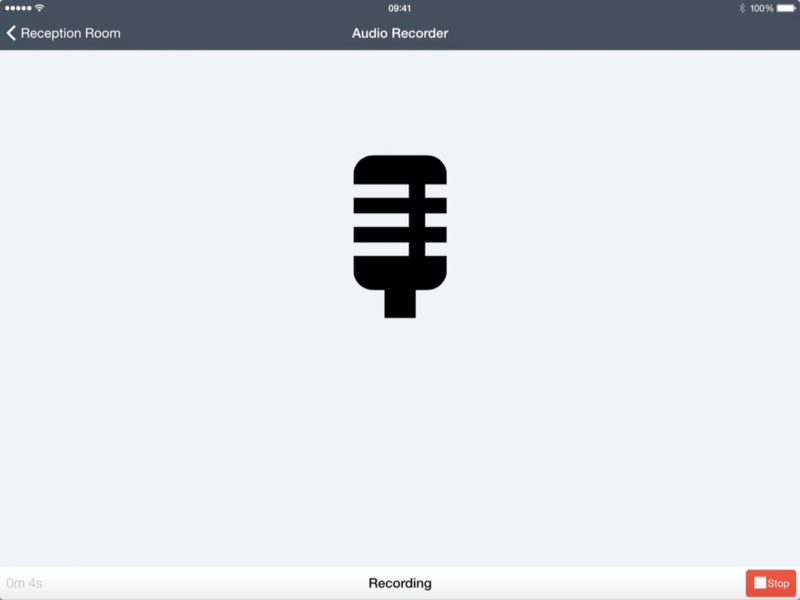 The Audio Dictation Recorder provides sound recording directly through the App which will be uploaded with your report/photos. 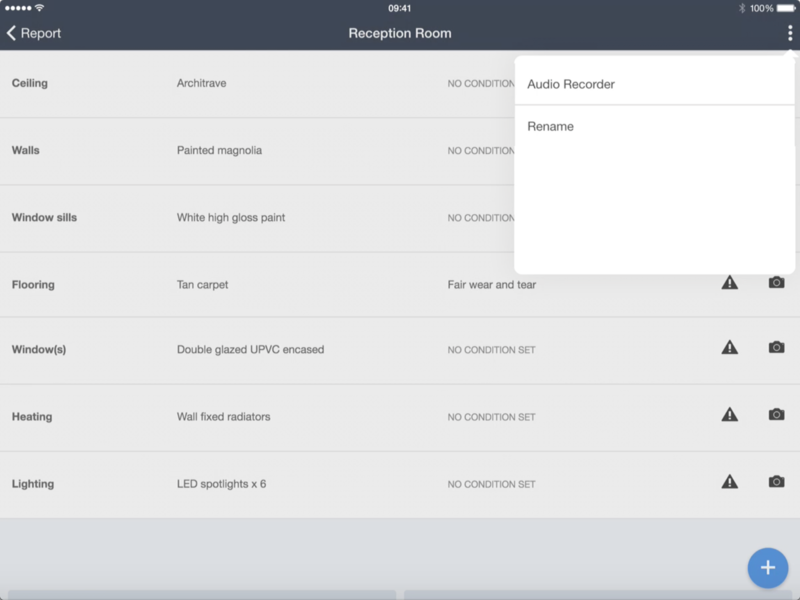 You can record one or more audio notes per room. Audio files are uploaded back to InventoryBase where they can be played back and transcribed either by yourself, your typist, or the InventoryBase Transcription Team. Once the report is complete, you now have two final steps. Click on the blue pencil on the bottom right of the screen to add signatures. If you don't want to get any signatures now, they can be added to the online report later if they're required. 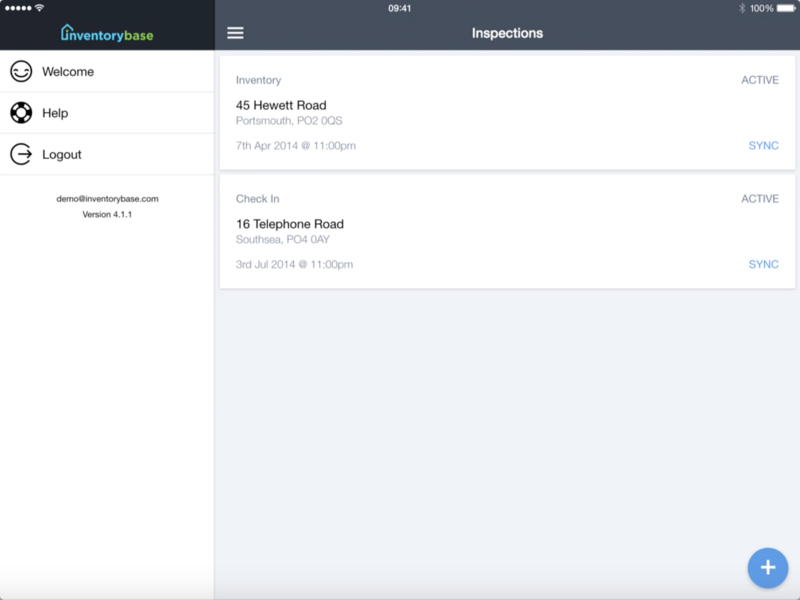 Click back 3 screens to the Inspections List, and click on the Sync button for the Inspection you just completed. You'll be asked to double check your Internet connection - OK that and the App will begin to upload your report and all photos/files to the InventoryBase server. You can complete your report before leaving the property, unless you want to make further changes later. Click Preview in the top right to view your report. This will show you the final report and allow you to flick through it with any third parties to agree all comments. If you want to take signatures now while with the tenant or landlord, you can do that once you complete the report. Once you are happy, click Complete at the top right of the screen, and confirm that you want to complete the report. 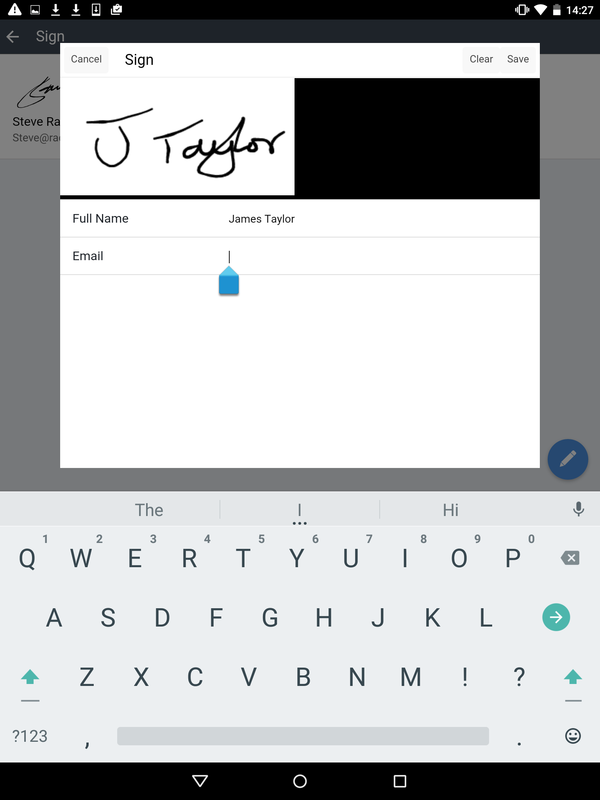 Click the Blue Pencil icon at the bottom right to capture signatures now. The next screen will be where you can then type tenant, landlord or third party details, including name and email address, and hand over for them to sign on the device, using their finger or a stylus. You can continue to add as many signature lines as you need to by clicking the pencil icon on the bottom right and choosing who's signing from the popup menu. If you capture email addresses with signatures, we'll automatically email them their report when it's marked complete, and if it's requires signing again after any changes are made. Once you’re done, or if you want to skip taking signatures, return to an area with WIFI or 3G/4G connection, return to the Inspections List page and click the blue Sync button on the Inspection you just completed. Click Sync from the main Inspections list located beside the property address you’ve just finished with. The Sync page will show you a full list of all pending data to be uploaded, including the number of attachments (photos, voice notes, video). When the report data has finished uploading you'll see a Tick mark appear, and it will begin uploading the photos showing you the progress of each. Note: Try to keep your device from sleeping during this time, especially if you have a lot of photos to upload. This may take a while! Once everything has sync'd successfully you can view your changes online and make any final amendments before marking complete for the Client. 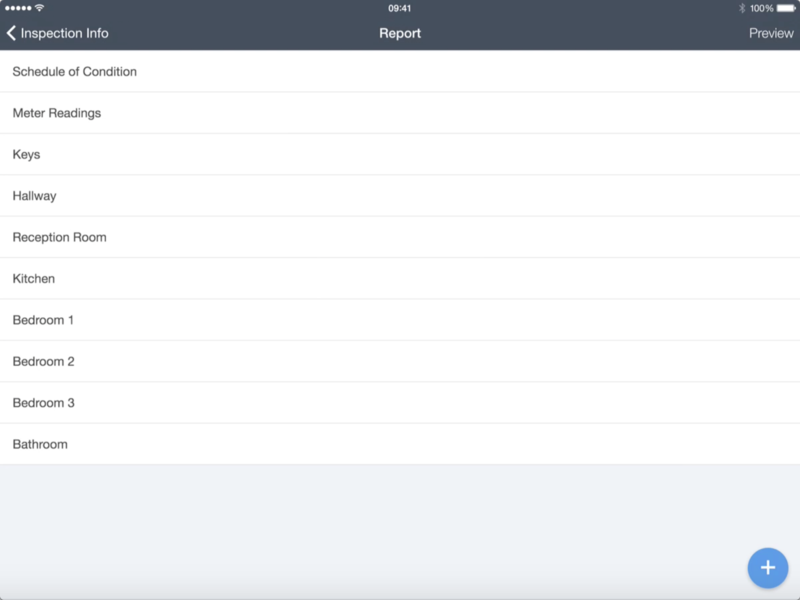 Once a Report has synced successfully, it will DISAPPEAR from your App. If an Inspection does not disappear after sync, it may have data still pending to upload and you should sync it again to be sure. If you Logout of the app before Syncing up your data, you will lose any un-synced changes. You will need to restore Internet connection to Sync your changes online. If you are uploading many photos, we recommend a stable WIFI connection. If you’re unsure how good your connection is, try going to any web page in your web browser and see if it loads as expected. If Sync remains unresponsive for more than a couple of minutes, double click your home button, swipe up/away InventoryBase, re-open it and repeat the Sync process to try again. If it stalls a second or third time with no progress for more than a minute or two, contact support. If you want to download the latest version of the report for an inspection, i.e. if you or someone else has made changes to it online, click and hold on the inspection within your inspections list and click Remove from Device. Then Swipe-Down to download it again. You can then review your report online making any final amendments before marking it as complete for the Client.